College Making It Happen (Bus Ride)! 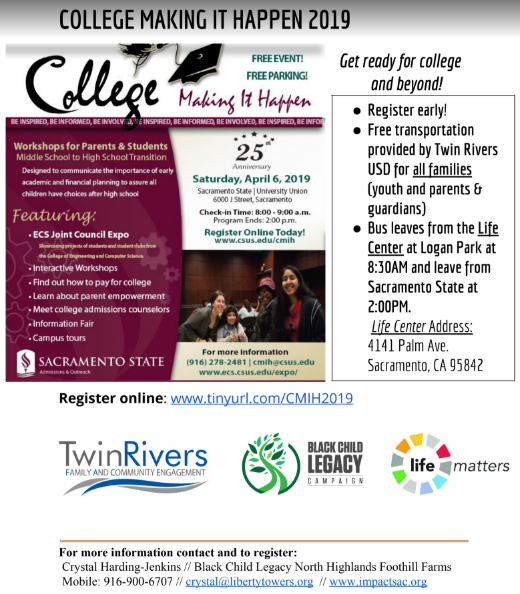 In collaboration with Twin Rivers Family and Community Engagement your student and family are invited to attend College Making It Happen at Sacramento State University this Saturday, April 6th from 8:30 am-2:30 pm. This opportunity is for all children, students, parents & guardians. The event provides practical and easy-to-understand information on how to prepare academically and financially for college, with interactive workshops, parent empowerment, and college admissions counselors, and much more. Twin Rivers USD will provide free transportation there and back, from the Life Matters Center at Logan Park Apt Community [4141 Palm Avenue]. Families are asked to arrive by 8:00am to pick up swag, event information, refreshments (ie: fruit, juice, water, granola bars) and start loading the bus, in order to leave on time for Sac State before 8:30am. Please visit the Life Center at Logan Park Apartments or call or text the event organizers at 916-900-6707 for more information.